Hello friends, it has been quite a while since we’ve been in touch! I’m back with you, offering, of all things, a cookie. Not just any cookie though. A cavity inducing combo of butter, chocolate and caramel. A carbo-phobe’s nightmare. A cookie that will get real with your resolutions and shatter them all to heck. And you. won’t. care. From whence comes such a thing? 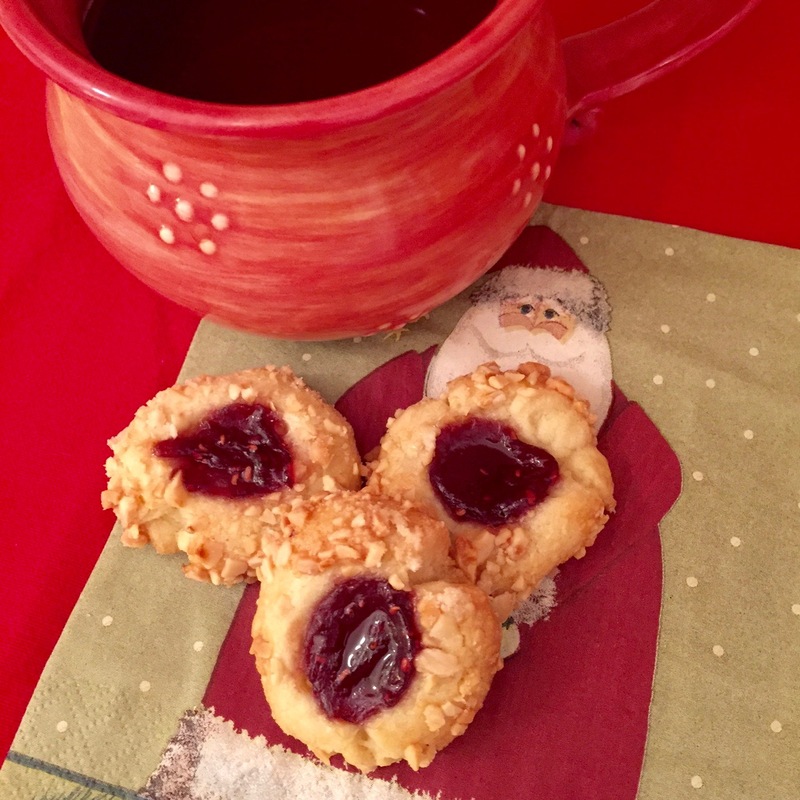 A delightful blog called Grandbaby Cakes where Jocelyn Delk Adams shares the love of baking she learned at her grandmother’s knee. I saw a picture of these cookies on Instagram and had to track them down. Salted Caramel. Chocolate Chips. OK? Perhaps I’m late to this party. Perhaps you all knew about hiding caramel inside a ball of cookie dough, then sprinkling with salt. But if you didn’t, don’t be afraid. Take my hand. We’ll do this together. Note: Fresh from the oven, I found these cookies far too sweet. I sadly set them aside thinking I’d have to give them to my sugar-cube loving friends. The next day, though, they looked so very delicious I ate one. Fabulous. Absolutely fabulous. You won’t be sorry. Neither will your dentist. .
Whisk together flour, cornstarch, salt, baking powder and baking soda in a medium bowl. Set aside. Unwrap caramels and cut each into quarters. In the bowl of an electric mixer, cream butter and both sugars until light and fluffy. Lightly beat together egg, yolks and vanilla, then add to the butter in three additions, beating until smooth after each addition. On low speed, add the flour mixture in three intervals beating well after each addition. Add chocolate chips and mix until well distributed. Use a #40 ice cream scoop to gather balls of dough. Press 4 caramel pieces into each ball and place on prepared baking sheets, 6 balls per sheet. Bake 14-16 minutes until brown. Remove from oven, sprinkle with sea salt and let cool on sheets 10 minutes before moving to a rack to cool completely. I rushed the cooling step and created little caramel aliens on the bottom of my rack. Makes about 30 large incredibly delicious cookies. OK, so yes, we completed the Seven Days of Cookies, but in the course of all that baking, I came across a recipe from Alice Medrich that cried out to be tried. So even though I’ve been rolling [in] dough for a week, I had to make one more batch of cookies. These are called Pebbly Beach Fruit Squares. The recipe is from Medrich’s Chewy Gooey Crispy Crunchy Melt-in-Your-Mouth Cookies. These are beyond delicious, a crispy-chewy sandwich of delightfulness. Alice says these cookies can be customized to your taste through your choice of fruit and spice. I love cranberry and orange so I used dried cranberries and candied orange peel with just a touch of cinnamon. Make sure your fruit is moist! If it’s not, Alice says to soak it in water, juice or spirits for about 20 minutes (any longer and it will be too mushy to use). Pat dry before using. Do the best you can when rolling the dough. It was a bit sticky so I rolled it between two pieces of parchment, flipping it several times and smoothing the paper. Even then I fell short of the desired 16.5 inch length. I wasn’t sure what to expect from this cookie. I knew it would be good (Medrich, dried fruit, butter), but I wasn’t prepared for just how good. The kind of good that makes you laugh out loud. Which is truly the best way to conclude a “baker’s dozen” of Seven Days of Cookies. Enjoy! And have a beautiful Christmas! Whisk together flour, baking powder, and salt in a bowl and set aside. In a medium bowl (with a mixer set on low), beat butter with the granulated sugar until smooth and well blended but not fluffy. Add the egg, vanilla, and both zests, and beat until smooth. Add flour mixture and mix until completely incorporated. Divide the dough in half and form each into a rectangle about ¼ inch thick. Wrap the patties in plastic wrap and refrigerate for at least 2 hours. Preheat oven to 350 degrees. Position racks in the upper and lower thirds of oven. Line two large baking sheets with parchment and set aside. In a small bowl, stir together the dried fruits with the cinnamon. Remove dough from the refrigerator and let sit for 15 minutes to soften slightly. Press the top of the dough down lightly, then dust with half of the coarse sugar, again patting it lightly to make sure the sugar adheres. Use a heavy knife to trim th e edges. Then cut it into 4 strips and then cut each strip into 4 pieces to make 16 squares. Place cookies 2 inches apart on lined or greased cookie sheets. Repeat with remaining dough, fruit, and sugar. Bake for 12 to 15 minutes or until edges are lightly browned. Rotate pans from top to bottom and from front to back halfway through the baking time to ensure even baking. Let cool on sheets for about 10 minutes, then move to racks to cool completely. Cookies keep in an airtight container for a week. Yields 24 to 32 squares. I wasn’t able to roll my dough to the full 16.5 inches so I ended up with about 24 cookies. Lemon is not your typical holiday flavor but I love these cookies during the holidays. The bright freshness of the lemon and the super crunch is refreshing amidst the heavier, spicier seasonal sweets. I pulled the recipe card for these from a Martha Stewart Living magazine while at the salon a few years ago. I’ve been making them year round ever since. If you can get hold of some backyard lemons (or farmers market), it makes a difference. I think these are pretty special. Preheat oven to 350. Line a large baking sheet with parchment paper and set aside. Gently crush the anise seeds a bit before whisking together with the flour, cornmeal, baking powder and salt in a medium bowl. Set aside. Beat butter and 1/2 cup sugar on medium speed until light and fluffy. Beat in whole egg and lemon zest. Reduce speed and beat in flour mixture. Press dough into an even 1/4-inch thickness on prepared baking sheet. Brush with egg white; sprinkle with almonds and crystal sugar. Bake until golden, 22 to 25 minutes. Let cool on a wire rack. Break into pieces. 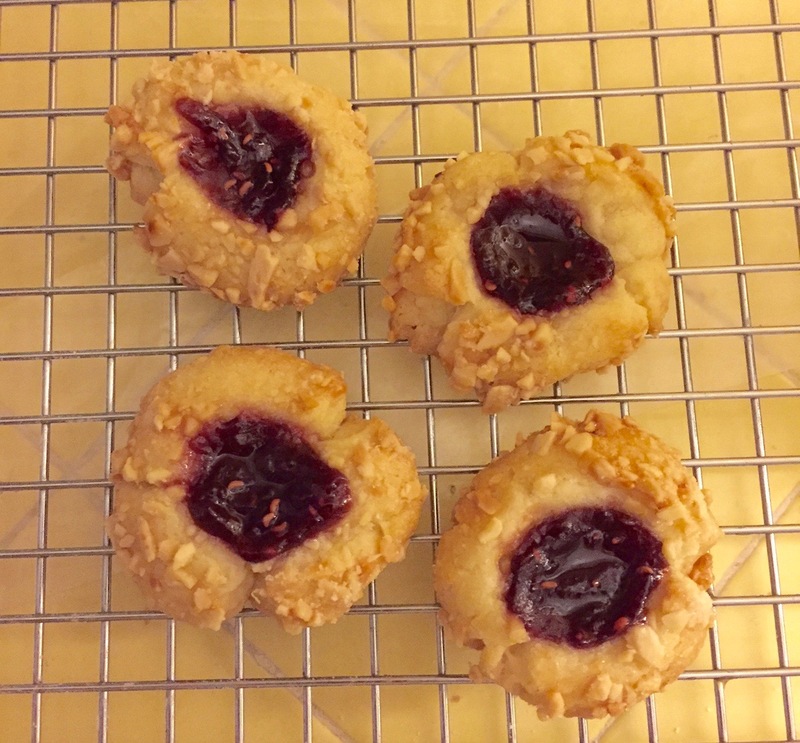 I love a jam thumbprint, especially when the cookie has been baked with the jam – it gets all chewy and delicious. There are a zillion thumbprint recipes but this one, adapted from Martha Stewart, is especially good. Martha’s original version calls for hazelnuts and strawberry jam. I prefer the Linzer flavors of almonds and raspberries. I don’t toast my almonds beforehand because I feel they get toasted enough in the baking. You certainly can if you like. The cookies are rich. The recipe makes only 2 dozen, but on a cookie tray, that’s more than enough. Preheat oven to 350. Line two large baking sheets with parchment and set aside. Cream butter and 1/2 cup sugar with an electric mixer on medium speed until light and fluffy. Add egg yolk, vanilla and almond extract (if using), and mix well. Reduce speed to low. Add flour and salt, and mix until just combined. Shape into a ball, flatten it slightly, cover in plastic wrap and chill for two hours. Remove chilled dough from refrigerator and let sit for about 20 minutes. Stir together chopped almonds and the 2 tablespoons of sugar in a small bowl. Set up a production line of your bowl of egg white, the nuts, and your prepared baking sheets. Using a small ice cream scoop (1-inch), scoop level amounts of dough and roll into balls. Dip balls into the egg white and then into the almond-sugar mixture. Space 1 inch apart on prepared baking sheets. Using the end of a wooden spoon or small pestle, press down the center of each ball. Make a fairly deep crater but don’t push through to the baking sheet. Fill each crater with a 1/4 teaspoon of raspberry jam. Bake for 16 minutes until golden brown. Cool on racks. Cookies keep 2-3 days in an airtight container. Peppermint is the flavor of the holidays, showing up in bark, hot chocolate, cakes and the ubiquitous candy cane. There’s nothing more cheerful than a candy cane but many of us, after the age of 13, like looking at them more than eating them. I don’t know, hard candies and sugar sticks – it’s tough to keep the dentist out of my head. This cookie gives you what you love about candy canes without the tooth-aching sweetness and guilt. Plus they’re pretty on the plate. And terrific with hot cocoa. Line 2 large baking sheets with parchment and set aside. In a large bowl, beat butter and powdered sugar with an electric mixer until fluffy. Add egg yolk and beat until blended. Add egg whites and extract, and mix well. The mixure will look grainy, don’t be alarmed. Gradually beat in dry ingredients. Stir in 1/2 c crushed candies. Gather dough into a ball, flatten it slightly, wrap in plastic and chill for about an hour. Preheat oven to 350°F. Position rack in middle of oven. Using a small (or one-inch) ice cream scoop, scoop blobs of dough and dip rounded tops into remaining crushed candies. Place two inches apart on prepared baking sheets. Bake for 12-14 minutes until lightly browned on bottom. Transfer to racks to cool completely. Melt chocolate and, using a small offset spatula, spread melted chocolate on the bottom of each cookie. Place cookies, bottoms up, on racks until chocolate sets. One of the best parts of the holidays for me (as you might imagine) are the cookies. I love to make them, give them, exchange them, receive them. Over the years, I’ve narrowed my personal baking selection down to a handful of exceptional, easy to make recipes. These are cookies that turn out great every time and each is a showstopper in terms of taste, texture, and beauty. Each also stands up to freezing, shipping and storing. For the next week, I’ll share a cookie recipe every day so that by Sunday you’ll have everything you need to have the most delicious cookie tray ever. This recipe is adapted from Epicurious. I’ve been making these every year since I saw them in the December 2006 Bon Appetit. They are light, delicious, and wonderful to give. Make sure your butter is soft but not warm, and do sift your flours. You don’t want anything to weigh these babies down. Also, note, if you ever wondered what making cookies was like in the olden times, this is the recipe to work with: Mixing in the 5 cups of flour by hand is a bit of work, but like with scones and shortbread, the warmth of your hands does something magical to the dough. Just go slowly and be patient, the results are well worth it. PS, this is why you should use a very large bowl. I use a rectangular 1 Tablespoon measure when forming the cookies, the results are more consistent. The original recipe says it yields 80 cookies. I reliably get about 60. Preheat oven to 350°F. Arrange racks on the top and middle of the oven. Line two large baking sheets with Silpat or parchment. Set aside. Beat butter and 1 cup powdered sugar in large bowl until light and fluffy. Beat in vanilla and salt, then pistachios and cherries. Dump in the flours and, us ing your hands, carefully work the flour into the butter mixture. Be gentle, you don’t want to overmix the dough. Using a rectangular 1 Tbs measure (or a generous round tablespoon), scoop dough and then roll in your hands into rough football-shaped ovals. Place on prepared sheets, spacing 1 inch apart. Bake cookies, rotating sheets halfway through, until bottoms just begin to color, about 16 minutes. Cool cookies on sheets 10 minutes before coating. Pour generous amount of powdered sugar into medium bowl. Working with 5 or 6 warm cookies at a time, add cookies to bowl of sugar; gently turn to coat thickly. Transfer cookies to rack to cool completely.